This book is not for everyone! The doors to the group will open on Feb1, 2013. Become a founding member then and make the battle against migraine a team effort! The Migraine Revolution Yahoo forum is intended for everybody who supports migraineurs’ efforts to transform into ex-migraineurs in the spirit of the book “THE MIGRAINE REVOLUTION: We can End the Tyranny”. You don’t have to be a migraineur to be a member and you don’t have to stay a migraineur either. 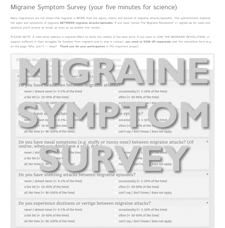 There are several migraine discussion-forums on the internet, dominated by the current regime and by a disempowering, discouraging, disenfranchising and drug-dependent doctrine of migraine as an “INCURABLE GENETIC NEUROLOGICAL DISEASE OF SWOLLEN INFLAMED BLOOD VESSELS THAT CAN ONLY BE ALLEVIATED BY MEDICATION ” and “THE WORLD IS A HOSTILE PLACE FOR MIGRAINEURS”. This reconfirms the already difficult, subjective experience of feeling helpless and hopeless, strengthens victim-attitudes and maladaptive schemas and reinforces passive-avoidant coping and understandable, yet unhelpful emotional behaviors that lead patients towards chronification. 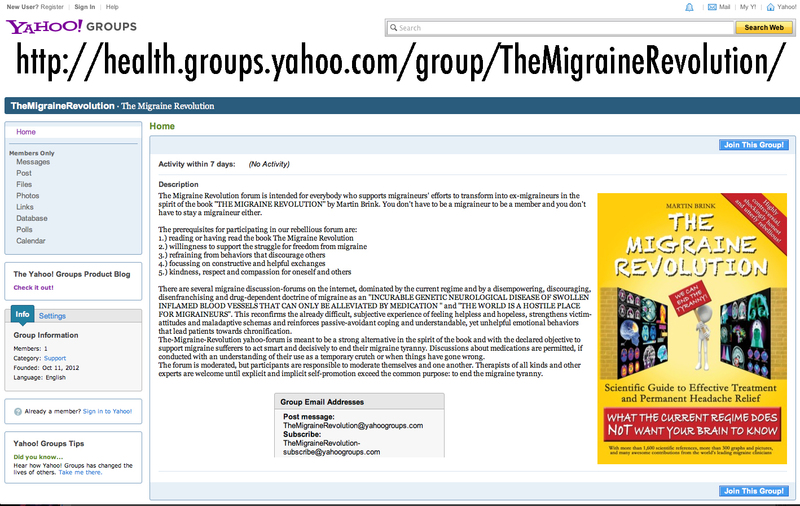 The-Migraine-Revolution yahoo-forum is meant to be a strong alternative in the spirit of the book and with the declared objective to support migraine sufferers to act smart and decisively to end their migraine tyranny. Discussions about medications are permitted, if conducted with an understanding of their use as a temporary crutch or when things have gone wrong. The forum is moderated, but participants are responsible to moderate themselves and one another. Therapists of all kinds and other experts are welcome until explicit and implicit self-promotion exceed the common purpose: to end the migraine tyranny. Please click the image to take part!